The Parliament Speaker Al-Ghanim handed over the message to the former American President during a short a visit to the United States, paid in response to an invitation from the ex-President. Emerging from the meeting with Bush, Al-Ghanim stated, "in a manifestation of gratitude that reflects genuine origin of the Kuwaiti people toward personalities whom we will not forget, I have been honored along with my colleague; member of the parliamentary caucus Yusuf Al-Fadhalah with handing over a written message from His Highness the Amir expressing his whole-hearted wishes (to Bush) so he may recover quickly and our appreciation as Kuwaitis for his heroic role in the liberation of Kuwait." The Speaker indicated that in contacts with the former president, during a health setback and after recuperation months ago, "addressed an (visit) invitation to us which we could not respond to at the time however we have managed to respond to it now." 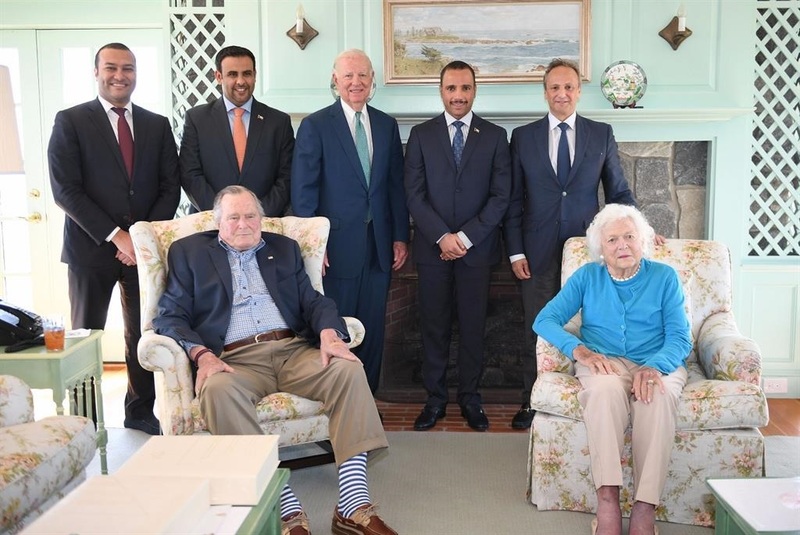 The former president was deeply touched during the meeting, along with the attending first lady and the ex-secretary of state James Baker, who was in office during Kuwait's liberation, with "the fact that this (Kuwaiti) people have remained faithful after quarter a century." Al-Ghanim described the meeting as very cordial noting that the ex-president appeared in good shape despite his old age. The speaker indicated that he heard, for the first time, from the American side, some occurrences during the flagrant Iraqi occupation of the State of Kuwait and liberation operation. The former American president expressed deep gratitude for the cordial sentiments, expressed by His Highness the Amir and the Kuwaiti people as well as their representatives in the parliament. Al-Ghanim has said the American people will positively eye this visit, which "affirms that we as people do not forget the personalities that have stood on our side during crises and hard days." The Kuwaiti delegation during the meeting displayed a video documentary chronicling his role during the blatant Iraqi invasion, with messages from the Kuwaiti people to his Excellency. Al-Ghanim expressed deep gratitude for the warm hospitality and the Americans' appreciation toward His Highness the Amir, as well as the visit, intended to inquire about well-being of "the friend of Kuwait the former president George Bush, such a personality that will not be forgotten by the Kuwaiti people." For his part, MP Al-Fadhalah said Speaker Al-Ghanim relayed to the ex-president greetings from His Highness the Amir, leaders and people of the country. The historic visit was paid to the U.S. former-president due to his extraordinary role during the flagrant Iraqi aggression. "The meeting touched on this period of time and we sounded out His Excellency about political events in the world and the United States in particular." "The delegation conveyed a significant message to the former American president that all Kuwaitis return the greetings today; quarter a century after liberating Kuwait," MP Al-Fadhalah stated.